We begin by describing and categorizing spam, which is the commonly used term for unsolicited commercial e-mail. We discuss ways to prevent spam, outlining different techniques available to avoid and block spam. We then explain how anti-spam control and management work can be divided between servers, between server tasks, and between administrators and end users. We also describe the anti-spam architecture of the Domino 6 messaging environment. Anti-spam features of Domino 6 are presented in detail. They include the ability to control connections from spammers and the delivery of spam, and protecting against the use of your server as an open relay. We also discuss using mail file rules and server mail rules to prevent spam. Finally, we highlight some of the business partner products available to further address the spam problem. These products fall into two categories: those that run on a Domino server, and those that operate as separate anti-spam servers and gateways. We include a number of examples of each type, along with references to help you obtain more information directly from them. 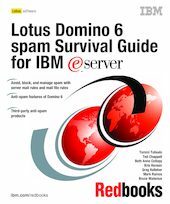 This book is written primarily for Lotus Domino administrators who want to prevent and manage spam in their environments. It is also useful as a basic introduction to the topic of spam.